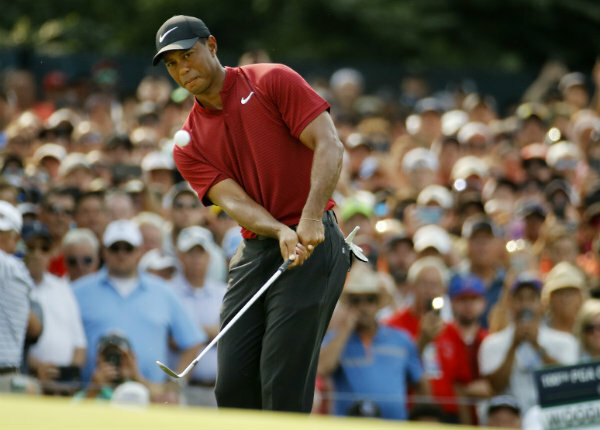 CBS reached 8.5 million viewers Sunday for final-round competition at the PGA Championship from St. Louis, a whopping 73 percent increase from the 4.9 million people who watched the same tournament’s conclusion in 2017, the Nielsen company said. Woods was the difference. The old hero was playing his best golf in years, leading to a second-place finish against champion Brooks Koepka. Koepka may have won, but crowds and newspaper headlines followed Woods. They were the best ratings for a PGA championship since 2009. Viewership peaked in the last half-hour of the tourney, when 12.3 million people were watching, Nielsen said. It was a typical midsummer week for prime-time television, dominated by games of singing, dancing and interpersonal manipulation. NBC’s “America’s Got Talent” led the way with 11 million viewers. NBC won the week in prime-time, averaging 4.1 million viewers. ABC had 3.9 million viewers, CBS had 3.8 million, Fox had 1.7 million, ION Television had 1.4 million, Telemundo had 1.2 million, Univision had 1.1 million and the CW averaged 800,000 viewers. Fox News Channel was the week’s most popular cable network, averaging 2.13 million viewers. MSNBC had 1.71 million viewers, HGTV had 1.33 million, USA had 1.29 million and History had 1.09 million. ABC’s “World News Tonight” topped the evening newscasts with an average of 7.9 million viewers. NBC’s “Nightly News” was second with 7.3 million and the “CBS Evening News” had 5.5 million. Below are primetime viewership numbers compiled by Nielsen for Aug. 6-12. Listings include the week’s ranking and viewership. 1. “America’s Got Talent,” NBC, 11.04 million. 2. “60 Minutes,” CBS, 8.21 million. 3. “The Bachelorette,” ABC, 6.72 million. 4. “Celebrity Family Feud,” ABC, 5.79 million. 5. “Big Brother” (Sunday), CBS, 5.74 million. 6. “Big Brother” (Wednesday), CBS, 5.64 million. 7. “NCIS,” CBS, 5.26 million. 8. “Big Brother” (Thursday), CBS, 5.15 million. 9. “American Ninja Warrior,” NBC, 5.02 million. 10. “World of Dance,” NBC, 4.75 million. 11. “CMA Fest,” ABC, 4.71 million. 12. “America’s Funniest Home Videos,” ABC, 4.63 million. 13. “The $100,000 Pyramid,” ABC, 4.61 million. 14. “The Big Bang Theory,” CBS, 4.57 million. 15. “NCIS: New Orleans,” CBS, 4.42 million. 16. “Bull,” CBS, 4.26 million. 17. “Young Sheldon,” CBS, 4.19 million. 18. “Making It,” NBC, 4.15 million. 19. “Mom,” CBS, 4.1 million. 20. “Dateline NBC” (Monday), NBC, 4.04 million.